The number of children in their first year of Montessori at full time is limited. Children inscribed in the Young Child Community (2/3 years) are priority. 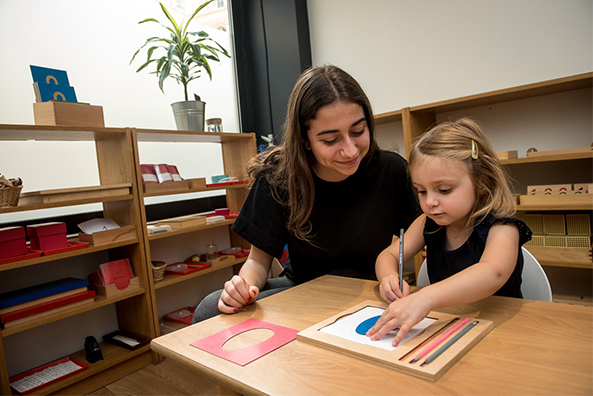 Two Montessori educators (3/6 years) graduates of the AMI (Association Montessori Internationale) and an English-speaking assistant supervise your child throughout the day. In the course of the school year we welcome trainee Montessori educators as well as trainee early childhood educators. Each child learns how to become autonomous and to respect the rules of living in a community. On a daily basis and in the respect of each child’s rhythm, handling and understanding the different materials allows the children to both improve their concentration and work on dexterity. The “at Montessori” school offers an international environment open to multicultural exchanges and diversity. The children are immersed in a bilingual classroom where they discover, absorb and become naturally familiar with a new language. To allow the class to function correctly, we kindly ask you to respect these times. The Montessori educator presents the activities individually to each child throughout the morning. In this way, he adapts to the rhythm of each child, and provides them with individualised monitoring. While the educator presents an activity to a child, the others can work on their own or in small groups with the help of the assistants. Musical awakening: The musical education workshop run by our music teacher takes place once a week for half an hour. All the children in the class participate in this class together. Using a fun approach, the children learn basic music concepts such as intensity or the diversity of sounds. They are also able to handle different types of instruments. Art workshop: This workshop is accessible all day. Everything is at the children’s disposition (easel, paper, paint, apron) so they can be totally independent. Children can paint at any time during the day without the need for intervention from the educators. This workshop is run by our english assistant. All the children participate where they sing or listen to stories in english. A small nap is offered to children in their first year. 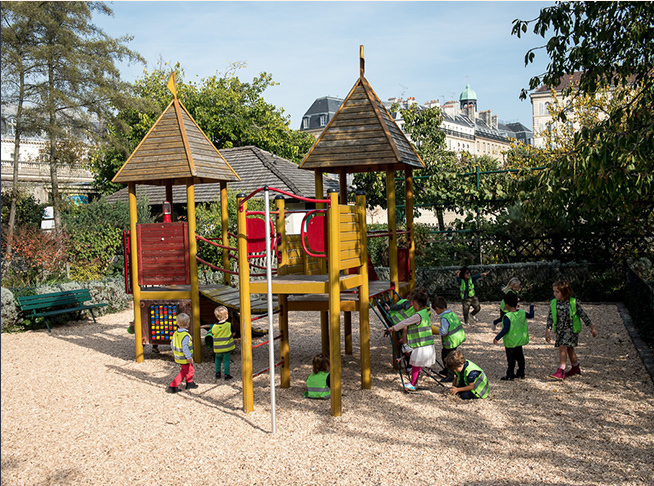 All the children at the school in rue de Babylone, the youngest as well as the older ones, go to the garden. Workshops (yoga, musical education, cooking) are on offer every evening after school. We welcome a 10 children per workshop. The children enrolled in the evening workshops have a snack between 4:00 and 4:15 pm “for further information”. The calendar for school holidays is issued by the French National Education department except for the summer holidays which start on the last Friday of June, after the school day. An individual meeting takes place in the month of November. Another meeting is proposed at the end of the school year for the children who have been re-enrolled for the following school year. Other meetings can take place in the course of the year by request of either the parents or the educators.